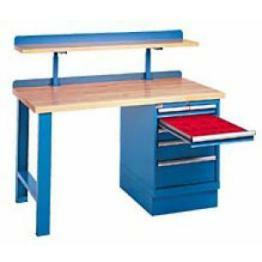 Industrial Workbenches,Heavy Duty Shop Workbenches - American Workspace Inc. Built for rugged durability, our Industrial Workbenches stand up to the harshest work environments. With their flexible selection of standard components and cost-effective custom configurations, our industrial workbenches are ready to serve. LISTA 60x30 Mobile Industrial Workbench, Butcher Block, Backstops for maintenance, repair, tool room, shipping, quality and shop floor. LISTA 60x30 Mobile Industrial Workbench, Laminate Top, Backstops for maintenance, repair, tool room, shipping, quality and shop floor. 60x30 Industrial Workbench, Butcher Block Top, Back and Side Backstops. For maintenance, repair, tool room, shipping, quality and shop floor. 60x30 Industrial Workbench, Laminate Top, Backstops for maintenance, repair, tool room, shipping, quality and shop floor. 60x30 Industrial Workbench, 1 Pedestal Cabinet, 1 Drawers, Laminate Top, Backstops for maintenance, repair, tool room, shipping, quality and shop floor. LISTA 60x30 Industrial Workbench, 1 Pedestal Cabinet, 4 Drawers, Laminate Top, Backstops for maintenance, repair, tool room, shipping, quality and shop floor. LISTA 60x30 Industrial Workbench, 1 Pedestal Cabinet, 4 Drawers, Butcher Block, Backstops for maintenance, repair, tool room, shipping, quality and shop floor. 60x30 Industrial Workbench, 1 Pedestal Cabinet, 5 Drawers, Laminate Top, Backstops for maintenance, repair, tool room, shipping, quality and shop floor. 60" x 30" Industrial Workbench, 1 Pedestal Cabinet, 5 Drawers, Butcher Block Top, Backstops for maintenance, repair, tool room, shipping, quality and shop floor. 60" x 30" Industrial Workbench, 1 Cab, 5 Drawers, Butcher Block Top, Backstops for maintenance, repair, tool room, shipping, quality and shop floor. 72" x 30" Industrial Workbench, Butcher Block Top, Backstops for maintenance, repair, tool room, shipping, quality and shop floor. 72x30 Industrial Workbench, Laminate Top, Backstops for maintenance, repair, tool room, shipping, quality and shop floor. LISTA 72x30 Mobile Industrial Workbench, Laminate Top, Backstops for maintenance, repair, tool room, shipping, quality and shop floor. LISTA 72x30 Mobile Industrial Workbench, Wood Top, Backstops for maintenance, repair, tool room, shipping, quality and shop floor. 72x30 Industrial Workbench, 1 Pedestal Cabinet, 1 Drawers, Laminate Top, Backstops for maintenance, repair, tool room, shipping, quality and shop floor. 72" x 30" Industrial Workbench, 1 Pedestal Cabinet, 1 Drawers, Butcher Block Top, Backstops for maintenance, repair, tool room, shipping, quality and shop floor. LISTA 72x30 Industrial Workbench, 2 Pedestal Cabinets, 10 Drawers, Butcher Block, Backstops for maintenance, repair, tool room, shipping, quality and shop floor. LISTA 72x30 Industrial Workbench, 1 Pedestal Cabinet, 4 Drawers, Butcher Block, Backstops for maintenance, repair, tool room, shipping, quality and shop floor. 72x30 Industrial Workbench, 1 Pedestal Cabinet, 5 Drawers, Laminate Top, Backstops for maintenance, repair, tool room, shipping, quality and shop floor. 72" x 30" Industrial Workbench, 1 Pedestal Cabinet, 5 Drawers, Butcher Block Top, Backstops for maintenance, repair, tool room, shipping, quality and shop floor.